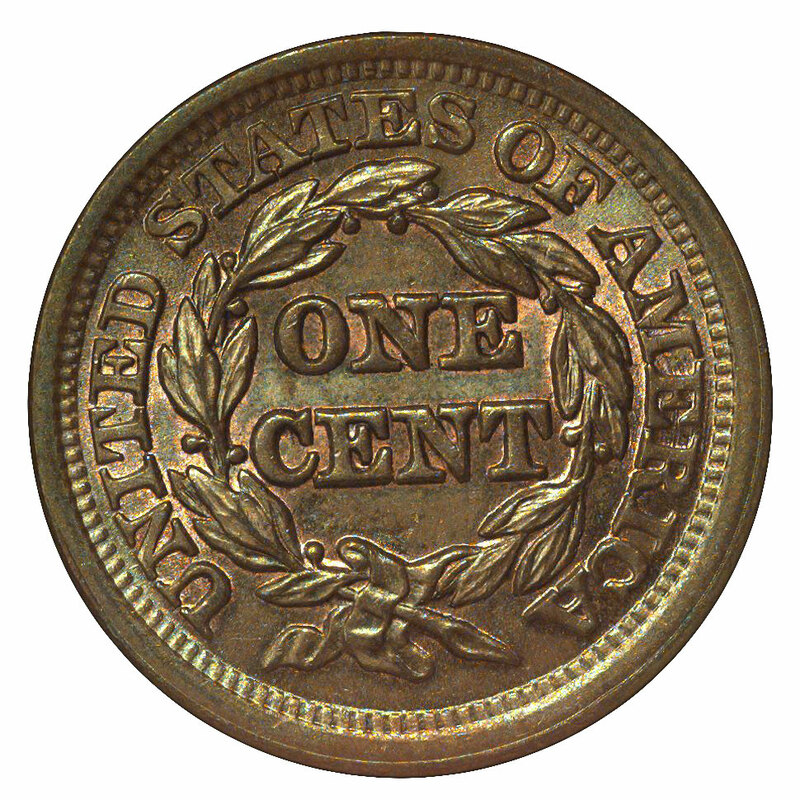 The Coronet Head Liberty design of the one-cent piece in use since 1816 underwent a series of subtle revisions following the hiring of Christian Gobrecht as second engraver in 1835. With designations such as Head of 1838, Silly Head and Booby Head, the cent was fussed over for some four years. What finally emerged toward the end of 1839 was the Braided Hair type. This design continued through the end of large cent coinage in 1857, though there are two subtypes within this series. The first version is known as the Petite Head and was employed 1839-43. The Mature Head debuted in 1843 and was used thereafter. Actually, there is very little difference between these two subtypes; the Mature Head is simply oriented in a more upright position so that Liberty's gaze is forward rather than downward. Braided Hair cents were coined annually in very large numbers, so there are no rare dates. Aside from some rare varieties, this series is easily completed in circulated grades and in the lower grades of mint state. Gems are obtainable for many issues, dates such as 1853 and 1855 having turned up in bank hoards. While fully red coins are scarce and often are found with black spots, they are nonetheless quite popular with collectors. More typical are coins that have partial red color evident in the protected areas of the design. The vast majority of mint state coins, however, have lost all of their mint red. These are usually some shade of brown, often with rich mint luster underlying this toning. Some coins will display subtle shades of green, blue or purple as a consequence of the copper and its impurities reacting with contaminants in the atmosphere. While this may sound alarming, the resulting coins are often quite beautiful and are highly prized by sophisticated collectors. When determining the grade of a mint state Braided Hair cent grading services place their greatest emphasis on luster and surface quality, as these are the issues of most concern within the coin market. There is another feature less often addressed by these professionals but one which should be considered by the astute coin buyer. This is the matter of a coin's die state, a term that refers to the condition of the dies when a particular coin was struck. Due to their large mintages, Braided Hair cents often display evidence of severely worn dies. This reveals itself as heavy flowlines on the surfaces of the coin and as distorted or missing design elements. While rarely affecting the certified grade of a coin, such die wear may seriously impair its aesthetic appeal to someone familiar with all the subtleties of the design. Personally I like to collect coins struck from fresh dies that still retained all the features imparted by the engraver. On the other hand, specialists in this series may eagerly seek the same variety in several die states, carefully cataloging each specimen as early die state (EDS), middle die state (MDS) or late die state (LDS). Such diversity of goals is what makes numismatics a very flexible pursuit. Some varieties of Braided Hair cents are always lacking in certain details as a consequence of poor die sinking from the outset. In other words, the die itself was incomplete in some respect, and all of the coins struck from that die will reflect this deficiency. Fortunately, given the dozens of varieties known for most dates in this series, with persistence one can find a sharply struck example of every date. The Official American Numismatic Association Grading Standards for United States Coins lists a number of varieties known to be lacking certain details and will be of assistance in shopping for an ideal type coin. Perhaps the biggest challenge in collecting coins of this type is avoiding ones that have been improperly cleaned. There's often a temptation to alter a brown copper coin into one that is fully or partially red. The degree of skill with which this deception is performed varies highly from one person to another, and some very attractive examples are in the marketplace. These coins, however, won't be certified by the major grading services.